The track laying has progressed well. All of the track in the middle (scenic) section is in place and there are two lines of track on each traverser. I started by laying the points, adding the Cobalt point motors and testing them to check they worked. I’m pleased to say everything was fine and I started work on the rest of the layout. The sleepers are held in place with track pins and glued to the baseboard with UHU. UHU is not my favourite glue, I find it can be rather ‘stringy’ and can leave long trails of glue over the work if you are not careful. Previously, I’ve used super glue to stick the track down but UHU has been good for this job because it takes longer to set and gives me more time to position the track. Each piece of track has an electrical connection. For the points and some of the track I soldered a wire to each rail and passed these through a large hole in the baseboard. 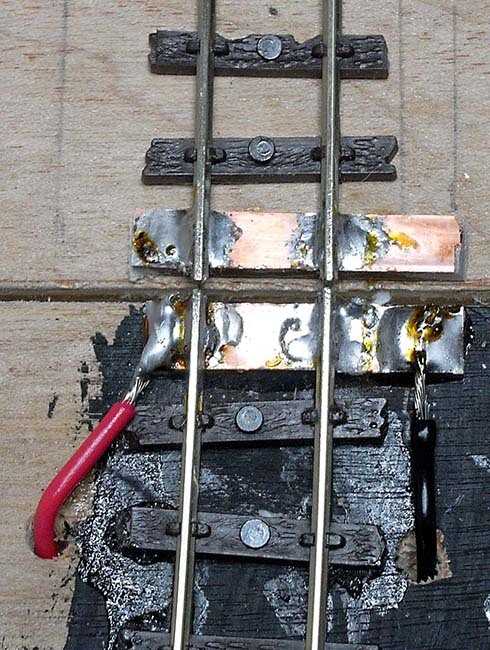 The track that leads of edge of the central scenic board has been soldered to small pieces of copper coated resin board to hold the rails securely in place. For these pieces of track I soldered the electrical connections to the copper coated board rather than directly to the rails. 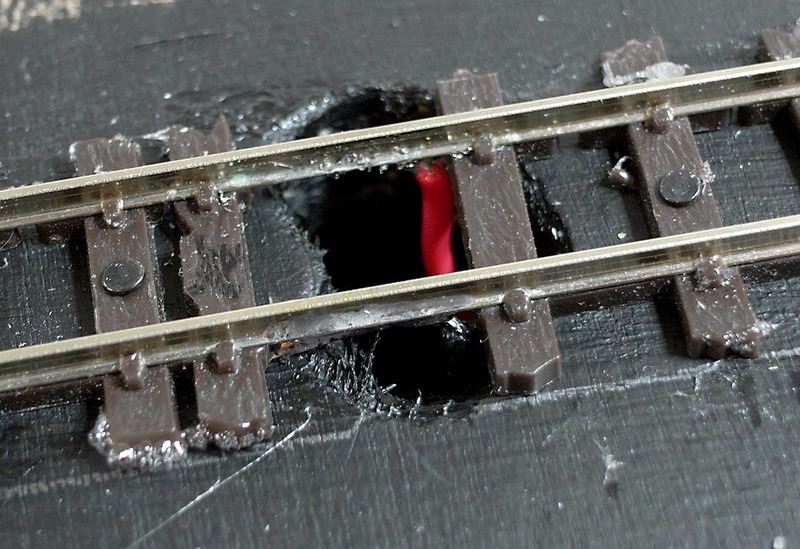 The track on the edge of the traversers has been soldered to copper coated resin board too. I haven’t connected the wires to the traversers yet. I have a couple of ideas for how to do this and I’m still trying to decide which will work best. I will add two more sections of track to each traverser soon. I think I will lay these sections and do the traverser electrics at the same time. This has been a real pleasure and I’ve thoroughly enjoyed it. I’ve done the work in small 30 minute sessions, spread over a few weeks. I enjoy doing 30 minutes work, stopping, thinking over the next steps and coming back to the layout to do the next job. This allows me to take my time and plan each step, and I find it more enjoyable than putting aside four or five hours for a mammoth track laying session. The track is laid, the wiring is in place but none of it is connected and, to be honest, the underside of the layout looks a bit of a mess.